Come to 221B Baker Street for fifteen incredible capers from the world's only consulting detective -- presented in full cast audio! 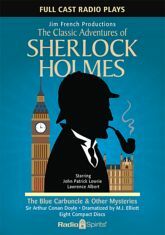 Based on the works of Sir Arthur Conan Doyle, and dramatized by noted British writer M.J. Elliott, these absorbing adventures star John Patrick Lowrie as Holmes and Lawrence Albert as Dr. Watson. Also heard in these sterling stories are Dennis Bateman, Rick May, David Natale, Jeffrey Hitchen, Rachel Glass, Hugh Hastings, Louise Moore, and Jim French himself!